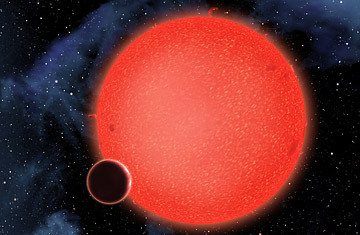 GJ1214b, shown in this artist's conception, is a super-Earth orbiting a red dwarf star 40 light-years from Earth. When astronomers discovered the planet known as GJ 1214b a couple of years ago, they knew they had an oddball world on their hands. They just weren't certain what form the oddness took. Whirling around a star some 40 light-years from Earth, GJ 1214b was about 2.7 times as wide as our home planet, with about 20 times the volume, making it a "super-Earth," about midway in size between Earth and Neptune. It was only about half as dense as our world, though, meaning GJ 1214b couldn't be made mostly of rock, like Earth. It might be a small chunk of rock with a huge atmosphere of hydrogen and helium  in essence a mini-Jupiter. Or it might be a bigger chunk of rock plus an awful lot of water, something like a junior Neptune. The scientists leaned toward the water-world explanation, but they couldn't be sure. As Zachory Berta, the Harvard grad student who first spotted the planet, puts it straightforwardly: "It was difficult to understand." Not anymore, though. A team lead by Berta has now used the Hubble Space Telescope to determine that the planet is indeed like Neptune's younger brother. That means it's fairly loaded with water, and that has big implications for finding earthlike biology in unearthly places. But it took a lot of astronomical sleuthing  not to mention some counterintuitive thinking  to suss out the new planet's nature. But hot as things are on GJ 1214b, they could have been hotter still. That's because its parent star is a so-called M-dwarf, much smaller, dimmer and cooler than the sun. In the early days of planet hunting, everyone was focused on worlds orbiting sunlike stars since they were thought to be the most likely places for life to arise. But it gradually dawned on the scientists that M-dwarfs might be home to habitable planets too, provided they orbited at just the right distance so that their ambient temperature would sustain liquid water, a sine qua non for life as we know it. What's more, since M-dwarfs are smaller, a planet orbiting them would be easier to spot, both because it would block a greater share of the star's light and because its gravity would cause more of a stellar wobble. It was to search for these promising planets around small, cool stars that Harvard astronomer David Charbonneau  Berta's mentor  founded the MEarth project, which uses small automated telescopes in Arizona to keep an eye on M-dwarfs, looking for the telltale dimming that would suggest a planet. GJ 1214b was the project's first discovery. The amount of dimming the telescope detected revealed the planet's physical size, and measurements of stellar wobbles made with other telescopes nailed down its mass. But this still left the mystery of what it was made of. The only way to answer that question was to get a look at GJ 1214b's atmosphere, and that's where the Hubble came in. The planet itself is impossible to see directly, but when it passes in front of the star, a bit of light shines through the atmosphere. By analyzing that starlight, Berta and his colleagues could search for evidence of water. As it turned out, they didn't find much  and that, paradoxically, means that there must be lots of it. The reason: if GJ 1214b were more like Jupiter, with a huge atmosphere made mostly of hydrogen and helium, it would include a trace of water vapor as well. "Water is so abundant in the universe," says Berta, "that it would be very weird to have none at all." The atmosphere's large physical size would spread that little bit of water across a large area, making it show up easily in the Hubble's detectors. No strong water signal from GJ 1214b's means no huge atmosphere. The only other possibility to explain the planet's density, then, is a lot more water, but packed so much more tightly that the Hubble couldn't pick it up. That doesn't mean that GJ 1214b is one great ocean though. With a surface gravity much stronger than Earth's, some of that water would be squeezed into ice  but this ice would be hotter than the boiling point of water on Earth. Some would remain liquid, but it would be what's known as a superfluid  a weird molecular state in which it could spontaneously flow uphill. "And on top of that," says Berta, "would be steam." These are not exactly the warm oceans and peaceful tidal pools in which earthly life first emerged. So why does any of this make astronomers more hopeful about finding exobiology? Because if one water world exists, so must others  and some of them might be in a more hospitable orbit. Indeed, the Kepler space probe has already spotted more than 2,000 likely planets with its powerful detectors, and nearly 300 of them are super-Earths. The catch is that none of them is nearly as close to Earth as GJ 1214b, so they are all out of reach of the Hubble's eye. The MEarth project, however, which has opened a second observatory in South America to complement its Arizona site, is looking only at nearby, Hubble-friendly stars. One of those could truly be home to what we call an ocean  and one of those oceans could be home to something even more remarkable.